...but was a ‘weak’ copy of Stanfield’s ‘Canal of the Giudecca and Church of the Gesuati, Venice’ in the Tate. Therefore it was asked if Stanfield did not paint what was previously titled ‘Italian Lake Scene’, then who did? A couple of users suggested it could be an autograph sketch by Stanfield, noting Small Seascape. However the poor quality of the sketch was once again discussed and this conclusion was rejected. The painting has been attributed to ‘after’ Stanfield and the title has been amended accordingly. What has been useful about this discussion is that now we know which painting this work is after. A painting description has also been added. 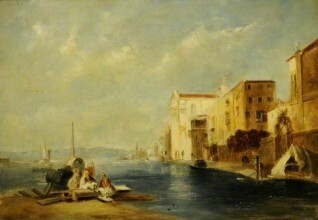 Who painted 'Italian Lake Scene', if not by Stanfield?